An elegant pair of 9-karat gold-filled, Victorian cuff links altered Derek Anastasia's wardrobe -- and his life. Derek Anastasia could wear a different pair of cuff links every day for 31 years. His collection includes some dating to the 1840s. The cuff links, a gift from his grandfather for his graduation from Indiana University School of Business 15 years ago, had at one time belonged to Anastasia's great-great grandfather. When Anastasia headed from business school to a job on Wall Street, where French cuff shirts are prevalent, he realized he'd need more than just one pair of the fancy cuff fasteners. Somewhere along the way, his search for variety became all-consuming. His collection now boasts 1,288 pairs of antique enamel cuff links -- enough to wear one pair a day for 31 years -- and 560 without a mate. And he's still buying: at least one pair a week, from dealers, antique shows, auction houses. He sometimes rises in the middle of the night to place bids online. "We all need something to be obsessive about," says Anastasia, who now lives in Fort Lauderdale. "This is one that won't get you into trouble except with money." He has spent as little as $4 a pair and as much as $500. The links date from 1850 to 1950, but most are from the early 20th century. Considered the largest collection of enamel cuff links in the world, Anastasia's cache is estimated to be worth half a million dollars. 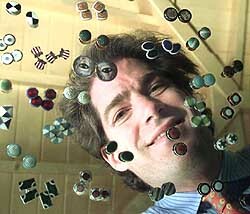 Anastasia has 1,288 pairs of cuff links, worth about $500,000. "It's truly extraordinary," says Gene Klompus, president and founder of the National Cuff Link Society. "Derek only buys high-quality enamel cuff links for his own therapy, for his own enjoyment, for his own love of the art. He truly has a world-class collection." Klompus, whose own cuff link collection includes many pairs of all varieties, formed the society a decade ago to serve as a resource for cuff link fans. The society, for which Anastasia serves as enamel adviser, has more than 8,000 members worldwide. Anastasia, 37, realized the breadth of his obsession two years ago at the society's annual convention in Chicago. For the first time, he displayed his collection for members. "It blew me away," he says. In the beginning he bought only cuff links he liked. But once he discovered enamels, he was captivated by their craftsmanship and sheen. "It has this gemlike brilliance," he says reverentially. He travels frequently for work -- he investigates the backgrounds of companies that clients wish to invest in. And, before every trip, he researches his destinations for antique shops and shows. He has found links from Bermuda to Moscow, but he has had his best luck in the United States, including close to home in Dania antique shops. Anastasia, who spends part of his time living in New York, keeps the collection -- except for the rotating stash he keeps at home to wear -- locked in a safe deposit in 40 black jeweler's cases inside two suitcase-style bags. Occasionally, he takes it out to pore over the shiny links that include hand-painted animals and people, art nouveau swirls, black-and-white art deco patterns, crests, emblems from Rotary and Kiwanis clubs, and just pretty patterns. 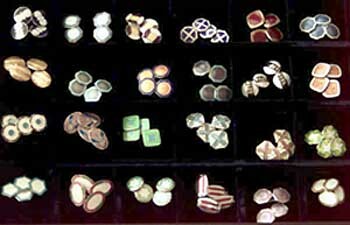 They are arranged by time period and type of fastener, which can aid in determining the links' age. Antique cuff links tend to be the ones made before 1943, when the American toggle fastener -- the swivel piece that keeps the links in place -- was patented, Anastasia explains. Antique cuff links often have fascinating pictures painted on them. Each link in his collection has a little story: a tiny piece of history, an exhaustive search, a great deal, or an amusing memory of how he found it. When he came across a red-and-white pair depicting a winged foot, made by a Boston manufacturer, he had a hunch. He called organizers of the Boston Marathon, which he has run several times, and asked whether the race ever had colors associated with it. Turns out, years ago the marathon's colors were red and white. The links might have been made for the marathon, Anastasia figures. He has three pairs of his favorites -- a tiny, delicate blue pair featuring on one side the 19th century tour a guilloche, or the hand-crank lathe used to make enamel cuff links. The industrial kiln used for firing the links appears on the other side. Anastasia's girlfriend, says she sometimes takes a back seat to her boyfriend's hobby. When she first met him, "I felt envious of someone who has such a passion, but in the same breath you think, well, I guess he has a little too much time on his hands." But when she saw the collection she was stunned. "It was one of the most magnificent things I'd ever seen. It's like an art gallery." Gift-giving can be a chore. Anastasia is known by many cuff link dealers and has seen most enamel cuff links for sale. Giving something other than cuff links, however, is not an option. "If he doesn't get cuff links for Christmas, he's like a kid not getting any toys." 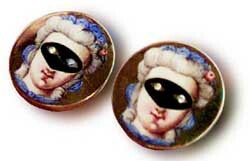 Anastasia has become an authority on the enamel links and he hopes someday to publish a manuscript he's written under the title The History of Enamel Cuff Links. "Not exactly a best seller," he jokes. He sometimes marvels at his collection. He waves an arm at the links spread in boxes across his dining room table: "That's my retirement fund sitting there."